We're hosting a live phone-in at 9pm ET / 6pm PT with MPs Andrew Saxton (parliamentary secretary for finance), Peggy Nash (Opposition finance critic), and Scott Brison (Liberal finance critic). Join our conversation by calling 1-877-296-2722, e-mailing primetime@cpac.ca, or providing your comments here online! NDP Leader Thomas Mulcair's scrum from earlier this afternoon now showing. Now we're on to Liberal Leader Justin Trudeau and his scrum from earlier this afternoon. Canada’s first federal budget was delivered by Finance Minister John Rose over several hours on December 7, 1867. Revenue and expenses at the time totalled less than $20 million. The longest British budget speech — without a break — was 4 hours and 45 minutes by William Gladstone in 1853. Benjamin Disraeli‘s 1867 speech was the shortest, at 45 minutes. No comparable list exists for Canadian budgets. Why late in the afternoon? So that financial markets have already closed for the day. The budget’s content is kept secret (aside from a media lock-up) for the same reason. “Budget” is derived from French and Latin words meaning leather bag or pouch (bougette). It was first used as a financial term in the 18th century to describe the collection of economic documents held inside such a case. A 1733 pamphlet called The Budget Opened mocked Sir Robert Walpole, the British prime minister and chancellor of the exchequer, as a medical quack opening his bag to hand out wild economic prescriptions. Eventually the term “budget” became associated with a yearly financial statement. Watch now for a panel with Government House Leader Peter Van Loan, Opposition House Leader Nathan Cullen, and Liberal House Leader Dominic LeBlanc. Mulcair: Conservatives don't think that government can be a good thing. Patting themselves on the back for restoring cuts to services like CFIA inspections that should have never been cut. Mulcair: apprenticeship plan will lead to a "battle royale" with the provinces, especially since the prime minister has not met regularly with the provinces. Mulcair does, however, support the funding for rural and northern broadband. Looming anti-laundering regul'ns for Bitcoin and online casinos were an interesting part of budget, but few details yet. Watch Live: Liberal Leader Justin Trudeau reacts to #bdgt14 w/ Peter Van Dusen. Trudeau: budget about making Conservatives look good in an election year, but Canadians are seeing past that. Also learned today that some microbreweries w/ new craft beers were running into regulatory issues b/c of old product def'ns. Trudeau: with a growing economy, the budget will balance itself. Martin Stringer has reaction from two finance critics: Peggy Nash (NDP) and Scott Brison (Liberal). 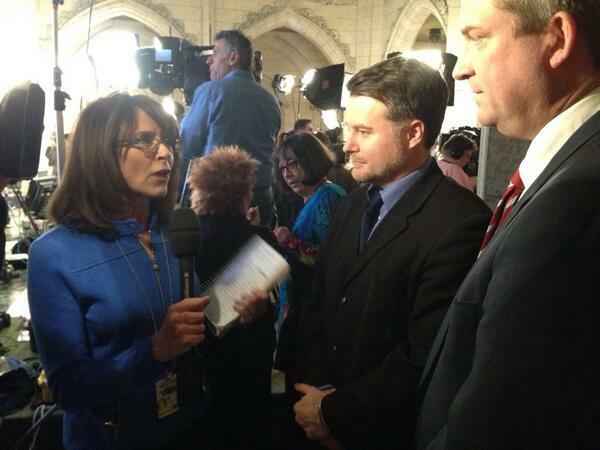 Good Q from Peter Van Dusen @CPAC_TV to @JustinTrudeau "If this was your #bdgt14 what would you have done?" Did he ask it to @ThomasMulcair ? @ezralevant CPAC asked Mulcair what would the budget look like under an NDP. His response! "We would tax tax tax tax tax tax on big Co.s"
Merci @CPAC_TV de nous donner les interviews des leaders au complet (avec le feed floor). Now we have reaction from the Retail Council of Canada on the Canada-U.S. price gap and promised legislation. Today’s budget predicts a $6.4-billion surplus by 2015-2016, though next year’s books are nearly balanced after accounting for money set aside for contingency planning. The 2014-15 deficit is estimated at $2.9 billion, while $3 billion has been set aside to adjust for potential economic risk. “We always planned to get to balanced budgets in the medium term,” Finance Minister Jim Flaherty said today. As for why the government held back on reporting a balanced budget, Flaherty said he prefers a more comfortable surplus in 2015, taking the rainy-day funds into account. That will be likely be the final budget before Canadians vote in the next federal election. The government projects the 2014 budget will save $9.1 billion over six years, largely due to reduced program spending and “managing compensation costs” for the public service. Budget day has traditions of its own, though less resplendent than the pomp of a Speech from the Throne. British custom dictates that the chancellor/finance minister can break the rules and drink alcohol inside the House of Commons while delivering the budget speech. Everything from whisky and wine to brandy and sherry has been spotted alongside the customary red despatch box carrying the budget speech — yet another Westminster routine. Neither of these practices became commonplace in Ottawa. But there has been a unique Canadian contribution to the list of budgetary rituals: the finance minister donning a new pair of shoes before giving his speech. And only men’s shoes so far, since no woman has held the position. According to the Library of Parliament, no one knows how or why this practice began. The first recorded instance of new footwear was Mitchell Sharp‘s 1966 budget. And there have been variations. John Crosbie wore mukluks. Paul Martin modelled work boots. Jim Flaherty instead bought Canadian-made skates for his son in 2007.